Green your home with free trees from City Plants! Learn how to apply for trees from the City Plants program and how to plant them properly once they arrive. Free trees are available to residents of the City of Los Angeles through an energy efficiency program in partnership with LADWP. Learn how to care for your new trees from City Plants. Help your trees grow healthy and strong with a little bit of love and attention! How should you care for your trees during the drought? Trees are a great way to keep your yard green and beautiful while being Water Wise! Learn how to efficiently water your new and mature trees so they grow healthy and strong for future generations! Know your property and what space you have. Determine which areas you can most effectively shade, and then select the right tree for that location. There are many factors that go into planting a yard tree, so we encourage you to consider all the right conditions for your particular species. “Right tree” means the species and full-grown size of the tree is best suited for your home and the area you have available to plant the tree. You can reference our Yard Tree List to determine how tall your new tree will grow and how the species will mature over time. Keep the full-grown size of your tree in mind when selecting the right tree for your property. “Right place” means the tree has enough space to grow to its full, mature height, and its root system has the space it needs to grow fully without interfering with surrounding infrastructure or underground pipes or utility lines. Don’t forget to plant to the west or east of your building to help reduce energy costs and save energy. 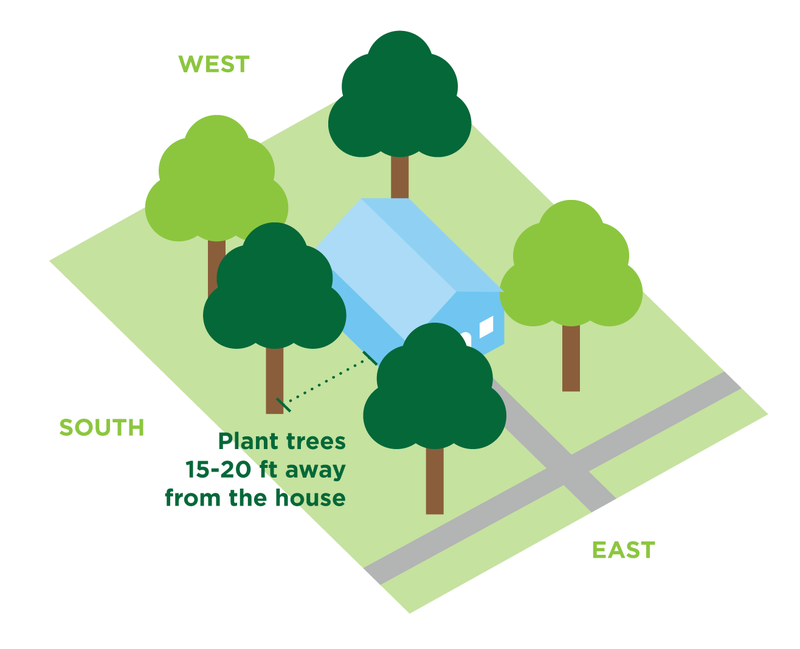 Where Should I Plant My Yard Tree? 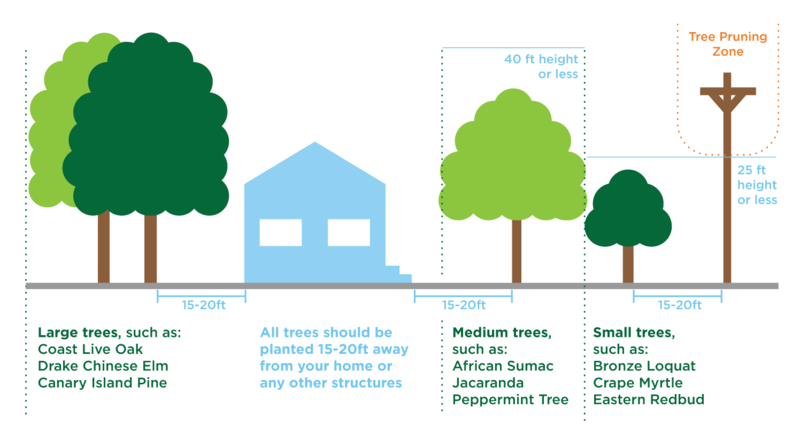 It’s best to plant trees a minimum of 15 – 20 feet away from your foundation, to the west or east side of the building. West is always the best for energy efficiency, as the trees will shade your home in the hot afternoon sun. Planting trees on the east side of your home helps shade it from the morning sun, but planting to the north will not provide much shade at all. You can also call 811 at least two days before you plant to make sure you won’t run into any gas or utility lines while planting. 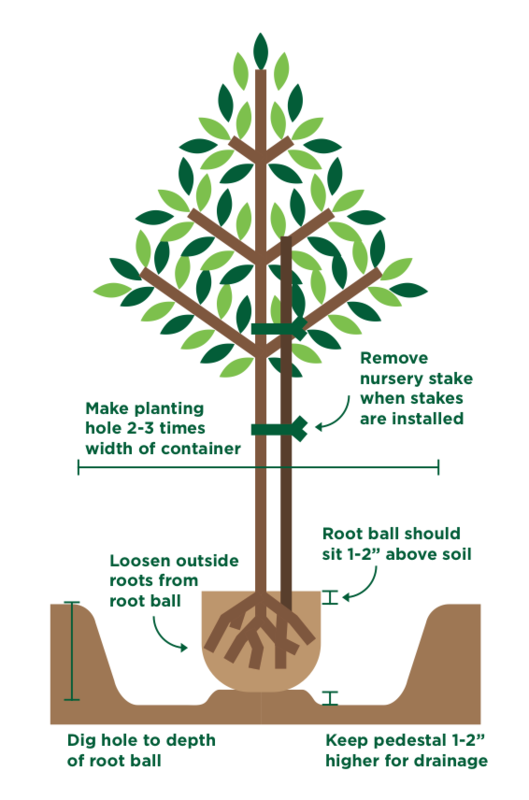 Follow the steps in our Tree Planting Guidelines so your yard trees grow strong and healthy. Provide ongoing care to allow the growth of healthy, mature trees that provide shade and other benefits to your and your neighbors. Like children, young trees need care. The first three years of life are the most critical for your young tree. Learn how to care for it properly so that it will grow strong and tall, providing you shade for years to come. Watering: Watering regularly is crucial to help your tree survive its first 3 – 5 years in its new home. Deep water your trees once a week with 10 – 15 gallons of water in the first three years. Mulching: Mulching helps save water and promotes healthy root growth. Placing mulch like wood chips around the base of your tree has many benefits, from reducing temperature, to keeping out weeds, to protecting from moisture extremes. It’s best to place mulch 2 – 4 inches deep and cover as much of the tree’s root system as possible. Keep mulch 4 – 6 inches away from your tree’s trunk. Pruning: During the first two years, leave lower branches on your young trees to encourage growth. After two years, you can begin shaping your tree for healthy structure. Do not remove more than 25% of the tree’s live branches in one year, and make sure there is always one central leader to encourage good structural growth. For more detailed information on tree pruning, check out the Arbor Day Foundation’s Tree Pruning Guide. Remember, never “top” your tree! More Tips: For more information on how to care for your tree responsibly while conserving water, click here.